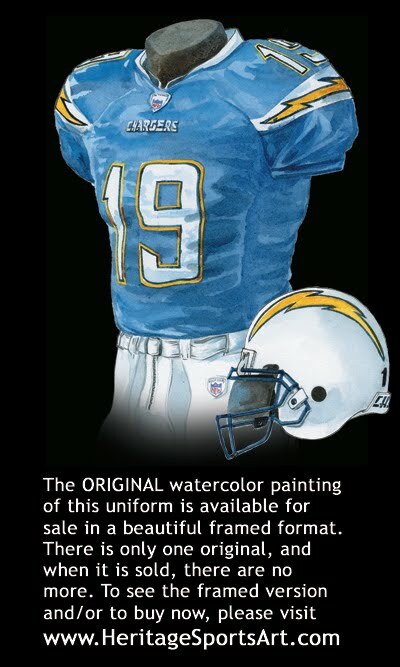 Please click on the evolution of the Chargers uniform poster above for a close-up version of the poster. The descriptions below give you some insight and background about the uniforms and/or eras depicted in the poster. On August 14, 1959, Barron Hilton, a 32-year-old hotel executive, was awarded a franchise for Los Angeles in the new AFL. The Chargers were born—and they hit the ground running. In 1960, they won the AFL Western division championship. Success notwithstanding, the L.A. Chargers received lousy fan support, so Hilton, buoyed by the encouragement of a San Diego sports editor, Jack Murphy, moved his team 120 miles south in 1961. 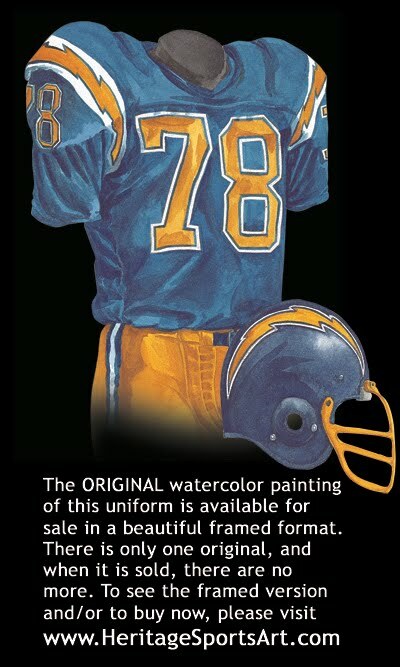 In 1966, Hilton sold the Chargers to Eugene V. Klein, who in turn sold the team to Alex G. Spanos in 1984. Spanos is still the Chairman of the Board. The change of scenery may have improved fan support, but it didn't do a lot for the Chargers on-field performance—after winning the AFL Western division in 1960, San Diego didn't win another championship of any kind until 1979. Da Da Da Charge!!! Da Da Da Charge!! !And that's where Barron Hilton, then owner, got the Chargers name from.Furthermore, the Chargers horse and shield logo are very similar to the USC battle Trojans with the sword and shield. The Lighting Bolt idea also came from Barron Hilton who was a fan of the Air Force college team and liked the lightning bolt logo." In a 58-20 win over Denver, eight Chargers scored and Paul Lowe rushed for 183 yards and two touchdowns on 17 carries as the Chargers clinch the AFL West title, finishing with 11 wins and 3 loses. The season ended a week later than scheduled after AFL postponed games the weekend following the Nov. 22 assassination of President John F. Kennedy. 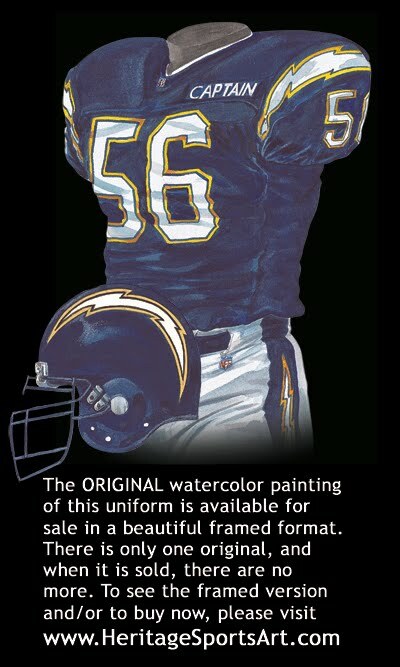 This jersey differs from any other jersey that we’ve seen in the league, as the stripes around the arms aren’t stripes – they are lightning bolts, a theme which has stuck throughout the years. If you look closely, you will see that even the pants have lightning bolts on the side of them. The helmet also has the bolts of lightning, with the player numbers on the side. The San Diego City Council endorses construction of a multipurpose stadium in Mission Valley, and drops the idea of a floating stadium in Mission Bay. On May 17th, City Council approved the expenditure of $750,000 for architectural and engineering drawings of a 50,000-seat stadium at the southwest corner of Friars Road and Murphy Canyon Road in Mission Valley. On Nov. 2nd, construction of a $27 million San Diego Stadium is authorized by a 73 percent "yes" vote by the citizens, and a Christmas gift is given to the fans on Dec. 24th as groundbreaking ceremonies are held for San Diego Stadium. Fullback Keith Lincoln runs 80 yards for a touchdown and combines on a 73-yard pass play for a touchdown as the West defeats the East 38-14 in the AFL All-Star game before 15,446 fans at Houston's Jeppesen Stadium. The game, originally moved from San Diego to New Orleans, was switched to Houston on a one day's notice after black players experienced mistreatment in New Orleans. San Diego wins its fifth AFL West title in six years by defeating Houston 37-26, finishing 9-2-3 on the season. In the AFL championship game at Balboa stadium, Buffalo defeats the Chargers 23-0 in front of 30,361 fans. A new automobile, the "Charger," was introduced by Chrysler officials during halftime. This white jersey colored the player numbers blue, outlining them in yellow. Note the arms - they are now short sleeves. 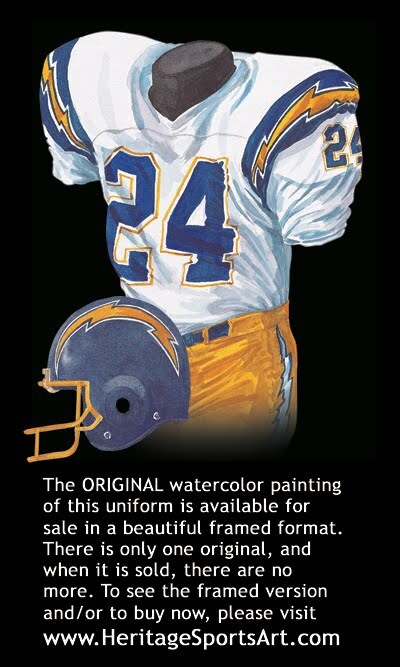 In keeping with their trend, the lightning bolts are located around the arms, on the pants, and on the helmet. Note the change of the mask on the helmet. Owner Barron Hilton sells the Chargers to Eugene V. Klein, where Klein in turn sold the team to Alex G. Spanos, a successful Californian businessman, in 1984. To this day, Spanos still serves as Chairman of the Board. The AFL All-Stars beat the Buffalo Bills 30-19, as Lance Alworth catches two touchdown passes. Chargers linebacker Frank Buncom is named defensive player of the game before a crowd of 35,572 in Houston's Rice Stadium. The American Football League and National Football League teams announce plans to merge in the 1970 season. The Chargers and Los Angeles Rams announce they will play three preseason games in San Diego Stadium, beginning in 1967. The Chargers were purchased by Eugene V. Klein of Beverly Hills, as he heads a group of 21 business executives who purchase the Chargers for $10 million, a record transaction in professional football. Even with many events taking place off the field, the team still had a winning season, going 7-6-1. This light blue jersey has the player numbers outlined in yellow. If you look closely, you will see that the pants have changed, and have plain vertical stripes. Note the change of mask on the helmet. The Chargers open the preseason at home and score their first victory over an NFL team, defeating San Francisco 30-18 before 39,553 in San Diego Stadium. This would be the start of a great season, as the Chargers finish the season with a 9-5 record. Leslie (Speedy) Duncan sets an AFL record with a 95-yard punt return for a touchdown in a 37-15 loss to the New York Jets in San Diego Stadium. QB John Hadl passed for 3473 yards and 27 td’s, while Dickie Post rushed for 758 yards. 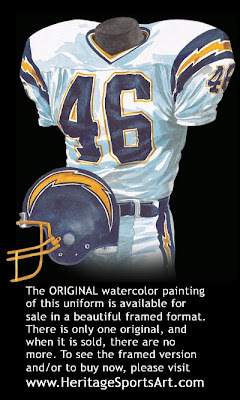 This white jersey has the lightning bolts around the arms – a look used to this day. 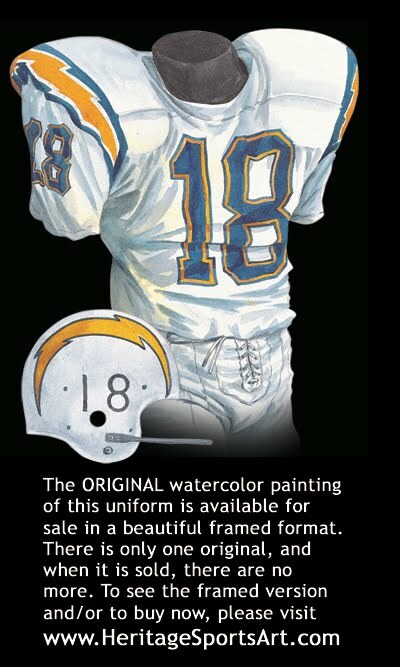 If you look closely, you will notice that the numbers are no longer outlines, and the lightning bolts are re-added to the pants of the uniform. Notice the change of the mask on the helmet. The Chargers obtain future Hall-of-Fame quarterback Johnny Unitas from Baltimore and in the second stage of the Unitas acquisition, the Chargers trade quarterback John Hadl to Los Angeles for defensive end Lander McCoy Bacon and running back Bob Thomas. Even with all this talent on the team, the Chargers finish the season with a 2-11-1 record. Unitas becomes the first QB to pass for more than 40,000 yards when he made a 30-yard pass to Mike Garrett against Cincinnati. Ron Waller was appointed interim head coach, and Harland Svare resigns. However, Svare remains with the team as general manager. The blue player numbers are once again outlined with yellow, while, looking closely, you will see that the pants have straight vertical stripes. Note the change of the mask on the helmet. This would be the last year the player nubmers would be seen on the side of the helmets – the only exception being in 1994 when most teams wore “throwback” jersey’s, which duplicated one of their earlier jerseys. One of the most intriguing games for the Chargers was when Rolf Benirschke's point after touchdown with time elapsed, after James Harris's five-yard touchdown run on the fourth down, gave the Chargers a 14-13 win at Miami. 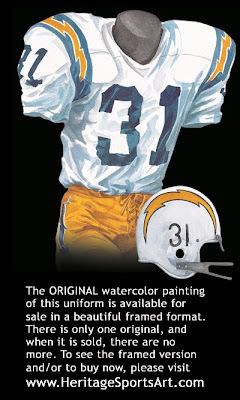 Lance Alworth, who starred for the Chargers from 1962-70, became the first member of Chargers' Hall of Fame at halftime during a Chargers game with Denver. With quarterbacks James Harris and Bill Munson sidelined with injuries, and Dan Fouts not having reported, the Chargers beat the defending Super Bowl XI champion Oakland Raiders 12-7 behind rookie quarterback Cliff Olander before 50,887 fans in San Diego Stadium. The Chargers finish their season with an even 7-7 record, good enough only for third place in the West. This dark blue jersey now has yellow player numbers outlined with white. The bolts of lightning are still on the arms and helmet, however the pants have straight vertical stripes. The helmet is now blue, and the mask is once again changed. Under head coach Don Coryell, the Chargers won three AFC West titles (1979, 1980 and 1981) and reached two AFC championship games (1980 and 1981). During Coryell's tenure, the Chargers played the same kind of exciting football that made the team so popular in the 1960's. Like Sid Gillman, Coryell emphasized the passing game and he had a future Hall of Fame quarterback, Dan Fouts, to drive the offense. Fouts' targets included such Hall of Famers as wide receiver Charlie Joiner and tight end Kellen Winslow. After advancing to the second round of the playoffs in the strike-shortened 1982 season, the Chargers dropped out of contention for the next 10 years. Eight Chargers made the AFC Pro Bowl squad and, for the first time in Pro Bowl history, three defensive linemen from the same team, Gary Johnson, Louie Kelcher and Fred Dean, are in the starting lineup. QB Dan Fouts passes for 330 yards and three td’s, FB Chuck Muncie rushes for 161 yards, and WR Charlie Joiner catches six passes for 191 yards as the Chargers rout Cleveland 44-14 before 78,904 fans in Cleveland for the season opener on Monday Night Football. Ernie Ladd and Walt Sweeney, stars of the sixties, were inducted into the Chargers' Hall of Fame during halftime at a Denver game. The Chargers clinch their third straight AFC West championship on the final Monday night of the season, defeating Oakland 23-10, for a record of 10-6 on the season. During the AFC Championship Game, the Chargers were defeated 34-27 against the Raiders, ending their playoffs with a 1-1 record. This white away jersey now has the lightning bolts on the pants, reuniting the pants with the matching bolts on the arms and the helmet. Note the mask change on the helmet. The Chargers set a club record even before the season starts; they have 107 players attend their Mini Camp. In 1966, Barron Hilton sold the Chargers to Eugene V. Klein. Klein in turn sold the team to Alex G. Spanos, a successful Californian businessman, in 1984. To this day, Spanos still serves as Chairman of the Board. Wide receiver Gary Garrison and head coach Sid Gillman are inducted into the Chargers' Hall of Fame during halftime of a game with the Denver Broncos. Lionel James gains 345 all-purpose yards in a 40-34 overtime victory against the Los Angeles Raiders, which puts him second in NFL history behind the 373 yards by Houston's Billy Cannon. James caught 11 passes and scored the winning touchdown with a 17-yard run. Gary Anderson returns the opening kickoff at Denver 98 yards for a touchdown, the second kickoff return for a touchdown in club history. Keith Lincoln went 103 yards Sept. 16, 1962, versus the New York Titans. Guard Ed White sets an NFL record by playing in 241 NFL games, the most among offensive linemen. Mark Herrmann also sets club records with 37 completions and 58 attempts at Kansas City while starting for injured Dan Fouts. All this, and the Chargers finish with an 8-8 record. 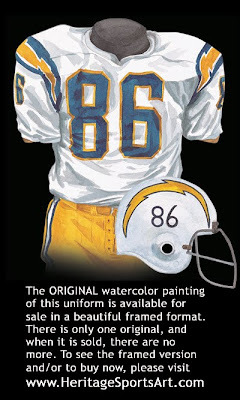 If you look closely at this white jersey, you will see that the neckline is outline with blue, white and yellow stripes. As well, note the change of the mask on the helmet. Many events take place off the field this season as Head coach Al Saunders signs a five-year contract, Steve Ortmayer is named Director of Football Operations, and WR Charlie Joiner retires with 750 receptions, the most in NFL history, and becomes the receivers coach of the Chargers. The NFL Players Association begin a strike which lasts 24 days, causing cancellation of week 3 games before the replacement teams are fielded. On October 15th, the strike ends. 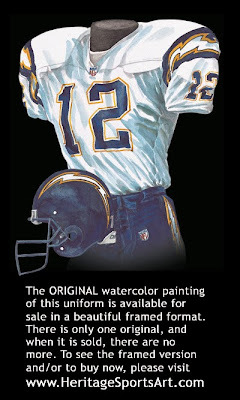 The "Re-Chargers" finish as one of NFL's two undefeated (3-0) strike teams, winning all games in the fourth quarter, culminating with a 23-17 win over the Raiders in Los Angeles, which was the Chargers first win against the Raiders in the Coliseum. San Diego's 16-14 win over the Raiders on national television gave the Chargers their eighth straight win and the best record in NFL (8-1) as well as their first sweep of the Raiders since 1981. San Diego finishes with an 8-7 record. This is their first winning record since 1982, despite winding up with six straight losses and a 24-0 loss in Denver. This blue jersey has yellow lightning bolts around the arms as well as the helmet, however the lightning bolts on the pants have now been removed, leaving a blue vertical stripe. Note the change of the mask on the helmet. In 1992, former Georgia Tech coach Bobby Ross was hired to restore the Chargers' glory. He did so almost immediately. In his first season, San Diego won the AFC West. Two years later the Chargers defeated the Pittsburgh Steelers, 17-13, in the AFC championship game and earned a trip to their first Super Bowl. Unfortunately, they lost the Super Bowl to the San Francisco 49ers, 49-26. San Diego sets an NFL record by winning four straight games, defeating Indianapolis 34-14, after losing four in a row. The Chargers clinch their first playoff berth since 1983 with a 36-14 win in Oakland, and make history as the only team to start 0-4 and make the playoffs with a winning record of 11-5. The Chargers win the AFC West title with 31-14 victory over Seattle in Kingdome in front of 63,834 fans for the go-ahead to play the Kansas City Chiefs in the Wild-Card playoff game. San Diego wins the game 17-0, but unfortunately, they can’t get by the Miami Dolphins as they down the Chargers 31-0 on home turf. The only major exception to this practice was in 1994 when the teams wore their throwback uniforms – in these cases, as is the case here, most teams did not wear the NFL shield patch on their jersey or pants. 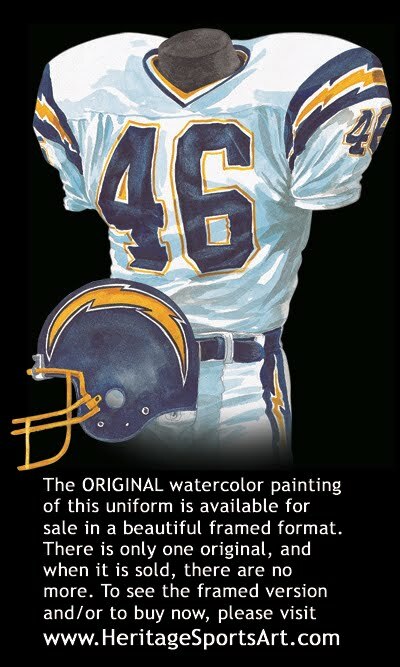 As well, if you look on the legs of the pants, you will notice that the lightning bolt has been added, and a Captain’s Patch has been added to the left side of the jersey. Notice the mask has changed on the helmet. In 1994 the NFL celebrated its 75th anniversary (1920 - 1994). 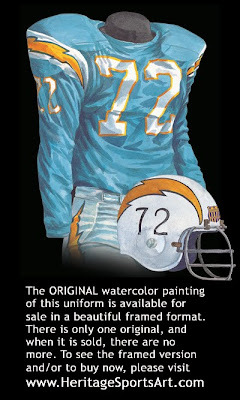 As part of the 75th anniversary celebrations, during selected games in the 1994 season, teams wore uniforms and helmets designed to resemble those from an earlier season in the team's history. While some teams wore the "throwback" uniforms for only a few games, others used them for most of the season - for instance the San Francisco 49ers wore them for almost the entire season, including the Superbowl. 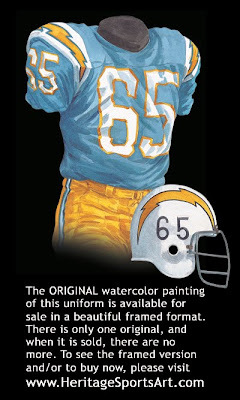 This light blue jersey was used to represent the 1966 jersey, while using the pants from the 1963 season. If you look closely, you will see that they even changed the helmet to match. Notice, however, that the mask is different than those in the early days. The Chargers fall to the Atlanta Falcons, 21-17, in only the team's second appearance in the Hall of Fame game in Canton, Ohio. San Diego made its first appearance in an American Bowl game, only to lose to the New York Giants, 28-20, in Olympic Stadium in Berlin, Germany. The game concluded the longest road trip in team history, while playing just two games during the 10-day trip. In the season opener against Denver, Stanley Richard returns an interception 99 yards for a touchdown to give San Diego a 27-24 lead at halftime on the way to a remarkable, 37-34, come-from-behind win. Stan Humphries and Tony Martin combine on a 99-yard touchdown completion to tie an NFL record and help defeat the Seahawks in Husky Stadium, 27-10. The Chargers defeated the Raiders in Los Angeles, 26-24, on a 33-yard John Carney field goal with two seconds remaining, and improved their record to 4-0 - the team's best start since 1980. San Diego remained the NFL's only undefeated team (6-0) by winning on the road in New Orleans, 36-22. The Chargers clinched the AFC Western Division title with a 21-6 win over the N.Y. Jets in Giants Stadium, leaving them with an 11-5 record. 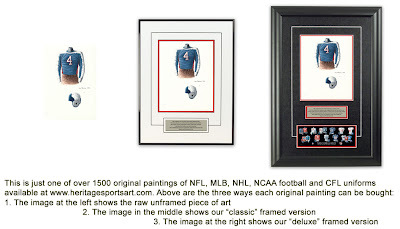 In 1994 the NFL celebrated its 75th anniversary (1920 - 1994). 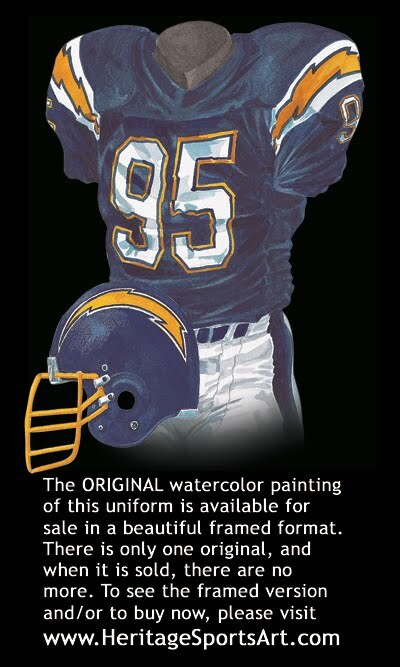 As part of the 75th anniversary celebrations, during selected games during the 1994 season, teams wore uniforms and helmets designed to resemble those from an earlier season in the team's history. While some teams wore the "throwback" uniforms for only a few games, others used them for most of the season - for instance the San Francisco 49ers wore them for almost the entire season, including the Superbowl. 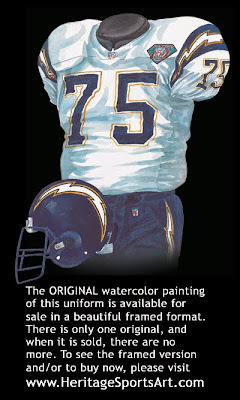 This white jersey has the NFL logo on the neckline and left thigh, as well as a patch on their left shoulder, which celebrated the NFL’s 75th anniversary. Note the change of the mask, and if you look closely, you will see that the lightning bolt on the helmet is now white, which is still used to this day. Also, if you look closely, you will see that the player numbers have been added to the back of the helmet. The Chargers finish the 1999 regular season with a 12-6 win in Denver, giving San Diego an overall record of 8-8 and an intra-division mark of 5-3, the best in the AFC West. The win in Denver is the team's first since 1994, and the 8-8 mark is the team's best since 1996. This season they finish with a dismal 1-15 record. The Spanos family and the Chargers announce the contribution of more than $3 million toward the new Chargers Champions community outreach initiative benefiting students, schools and educators who are "making the difference" for San Diego's future. 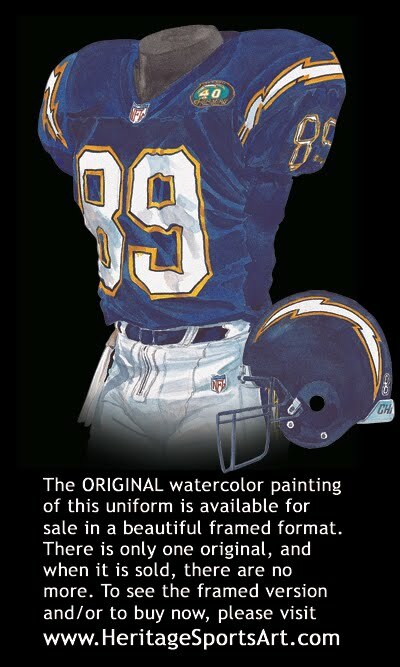 Chargers Champions also encompasses the team's ongoing support of youth and high school football, as well as its long-standing community service programs, such as the Blood Drive. Bobby Beathard, who helped guide the Chargers to Super Bowl XXIX as well as two AFC Western Division Championships and three playoff appearances during his 10 years as general manager, retires after 37 years in the NFL. Beathard is replaced by Ed McGuire, who is named Vice President of Football Operations by team President Dean Spanos. The Chargers honor 22 local high school juniors as the first Chargers Champions for demonstrating leadership, service, citizenship, and commitment in their schools and communities. Each student receives a college tuition scholarship of $7,500 as well as a state-of-the-art laptop computer. The Spanos family contributes $250,000 through Chargers Champions to create and fund freshman football and freshman volleyball in San Diego City Schools beginning in Fall, 2000. 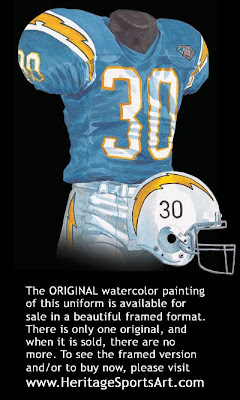 This blue jersey has a different patch this year, while the team celebrates their 40th anniversary. Note the change of the mask on the helmet. If you look closely, you will be able to see the player numbers now on the back of the helmet. Dean Spanos names John Butler as the team's new executive vice president and general manager. Butler, the former general manager of the Buffalo Bills, began his NFL career in 1985 as staff scout with the Chargers. During his tenure in Buffalo, the Bills reached the playoffs 10 times and played in four Super Bowls. Norv Turner, the former head coach of the Washington Redskins, is named offensive coordinator by head coach Mike Riley. Turner, who has 16 years of NFL coaching experience, helped lead Dallas to back-to-back Super Bowl championships in 1992 and '93 as the Cowboys offensive coordinator. The Bolts sign Pro Bowl quarterback Doug Flutie, yet another free agent from Buffalo, to a six-year contract. Flutie arrives in San Diego after three seasons with the Bills where he had a record of 21-9 as the team's starting quarterback. Flutie also spent eight seasons in the Canadian Football League where he was the CFL's Most Outstanding Player an unprecedented six times and won three Grey Cup championships. On the heels of a 1-15 season, the Chargers trade the top pick in the 2001 NFL Draft to the Atlanta Falcons in exchange for the Falcons' first-round pick (fifth overall) and third-round selection in the 2001 draft. The Chargers also obtained wide receiver/kick returner Tim Dwight and the Falcons' second-round pick in the 2002 draft. The Chargers use their top two selections in the draft to select two Heisman Trophy finalists, running back LaDainian Tomlinson of Texas Christian University and quarterback Drew Brees of Purdue. All this work, and finish the season at 5-11. If you look closely, will notice the NFL patch on the neckline as well as on the left thigh. 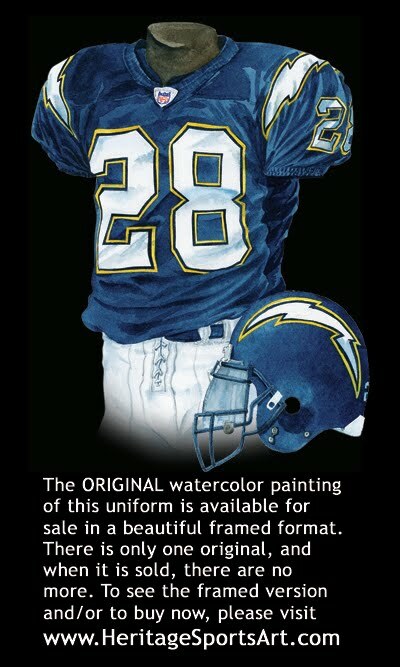 The lightning bolts on the shoulders keep in line with the pants and the helmet. Note the change of the mask. As well, if you could see the back of the helmet, you would see an American flag honoring the heroes of the tragic events of September 11th, 2001. After watching QB Drew Brees struggle for three seasons, the Chargers engineered a draft day deal that saw them trade away the first overall pick, Eli Manning, who was reluctant to play in San Diego, to the Giants for the 4th pick overall Philip Rivers and three draft picks. Now the Chargers had 3 QB’s: Brees, Doug Flutie and Rivers. This meant Brees’ starting job was very much in jeopardy. Fortunately for Brees, Rivers held out for half the preseason. As a result, Brees was named the starter six days before the 2004 season opener. Brees held onto the starting job with some impressive play, leading the Chargers to a remarkable 12-4 record and their first AFC West championship since 1994 and their first playoff appearance since 1995. Brees threw for 3,159 yards, 27 touchdowns and only seven interceptions. His 104.8 passer rating ranked third in the NFL behind Peyton Manning and Daunte Culpepper and was a 37.3 point improvement over the previous year. The great numbers were good enough to earn Drew a spot on the AFC Pro Bowl roster. As mentioned, the Chargers’ 12-4 record made them the 4th seed in the AFC for the playoffs, which meant they would host a Wildcard game. The Chargers played host to the NY Jets and sadly were gracious hosts in allowing their guests to build a 10-point lead by the end of the 3rd quarter. But the Chargers would fight back in the 4th, scoring a field goal with 10:48 left and then holding off the Jets offence after a six minute possession. They got the ball back with 4:46 left and managed to score the tying TD when Brees hit Antonio Gates with pass in the Jets end zone with 16 seconds remaining. Unfortunately the comeback would end in overtime courtesy of a Doug Brien field goal with just 8 seconds left in the first OT period. Make the final score 20-17 for the Jets. 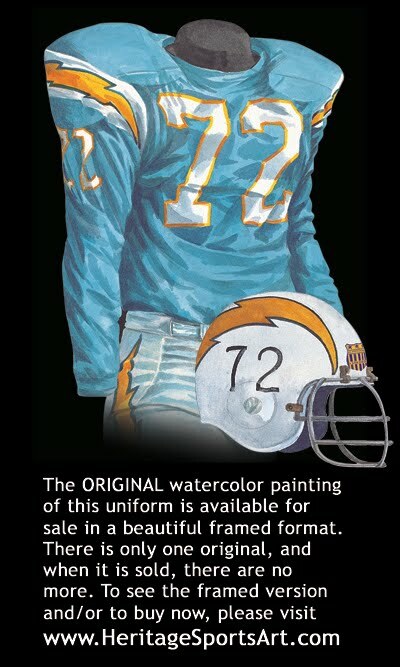 When the Chargers met the Jets at home in the playoffs they wore this dark blue home jerseys and white pants. You might notice that the shade of blue is a bit different than previous blues. You might also notice that the Chargers uniform features their lightning bolt logo on the jersey around the shoulders as well as on the pants down the side of the legs as well as on the helmet. Note also that if you look closely, you’ll notice an “NFL Equipment” patch on the jersey’s neckline and on the upper left thigh of the pants. This style NFL equipment patch, which is a bit bigger than the size of a golf ball, was added to all NFL team uniforms in 2002 The “NFL Equipment” patch replaced the previous “NFL shield” patch (which was the size of an average postage stamp) that had been worn on uniforms in the same two places (below the “V” of the neckline and on the upper left thigh) almost without exception since the 1991 season.